“Wow, what a crazy NAMM weekend. I barely know where to start. “Friday was the big NAMM Jam at the Grove that MEGADETH played. It’s sort of weird to play an ‘all-industry’ show. It’s not like playing for a packed house of MEGADETH fans, but the crowd was really great. I hear that the line to get in was around the building at 8 p. m. when they stopped letting folks in. “What was really awesome was all the positive feedback from all of the musicians and industry friends that came out to the show. “It’s pretty nerve-racking to play for a house full of established musicians! I even had the honor of one of my classical guitar heroes, Bill Kanengiser of the L.A. GUITAR QUARTET attending the show. His first metal show ever! “I posted a bunch of photos on my Facebook account if any of you are interested. “Bill is the guy that isn’t me, Jeff Loomis, or Rusty Cooley. Aahahaha. “That is the great thing about the NAMM convention, though — you get to see all sorts of friends and musical heroes all in one place. I got to meet Johnny Hiland, Meesha from PERIPHERY, and Paulo and Jean from SEPULTURA, even Tony MacAlpine (one of my electric guitar heroes) came up and said hi. I talked shop with Dino from FEAR FACTORY for a bit, and then there were about a hundred other folks that I barely got to say hello to like Kerry King [SLAYER], Frank Bello [ANTHRAX], and Robb Flynn [MACHINE HEAD]. The whole event was so crazy I didn’t even get to hang out with [fellow MEGADETH members] Shawn [Drover] and Dave [Mustaine] that much! 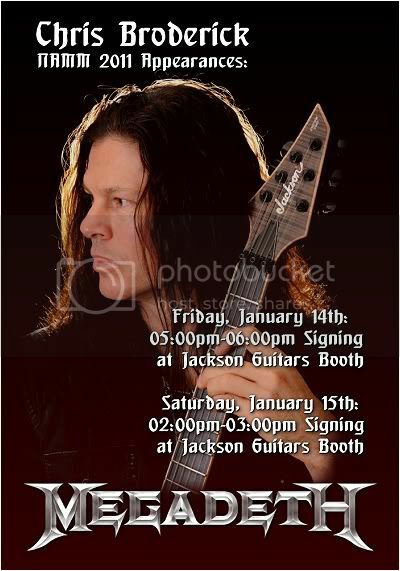 “[David] Ellefson and I did two autograph signings for Jackson (thanks to all of you who came up and said hello), and was glad to see the warm reception about my move to Jackson. I am also very excited for Ellefson‘s R.I.P bass (that looks great) and know he has many more awesome things planned at Jackson. “This week I’ll be heading down to Vic’s [Garage, MEGADETH‘s studio in San Marcos, California]. I’m so excited to start making some new MEGADETH music. You never know what sort of magic Dave has up his sleeve.